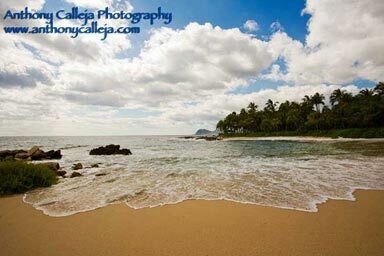 Oahu by far has the most beautiful wedding photography locations and many recommend having your ceremony and reception on Oahu, where famous Honolulu and buzzing Waikiki make their home, followed by a private honeymoon on the East or West side island, because the prices for weddings are generally lower on Oahu, there are a ton of spots to choose from, and it's easier to obtain a marriage license in Honolulu. If you choose to take this advice, there are a plethora of great locations in which to exchange vows, many of them free, as public beaches and parks in Hawaii are free to marry at but at times may require a permit. With the options of city and surf, nearly any type of wedding is possible on Oahu, so whether you want a more traditional church ceremony and hotel reception, or want to say your vows at the foot of a waterfall, you can make it happen in style on Oahu. Below, read up on some extraordinary outdoor locations. One of Hawaii's most famous landmarks, Diamond Head is just ten minutes from Waikiki and features postcard-worthy palm trees and ocean waves, plus stunning sunsets. There is a beautiful small green park at the base of Diamond Head crater with a coconut tree grove, a lanai, and an open lawn along the oceanfront. It is free to marry at Diamond Head, but there are no facilities and parking can be a challenge as Diamond Head Road is a crowded, two-lane, winding street. Since it is illegal to park, or even load and unload at the park's entrance, it's best to take a taxi (or limo! ), and may be better suited to smaller weddings. Park gates are open from 6AM-6PM. One of Oahu's prettiest beaches, sunny Kailua is home to gentle surf, fine, white-sand beaches, and world-class windsurfing. Several offshore islands can be spotted in the background, and there are picnic areas with pavilions and restrooms. One of Honolulu's best-kept secrets, Kakaako Waterfront Park is a spacious, well-groomed park, featuring rolling green lawns right on the ocean, vine-covered trellised pavilions, a small garden area (super for photos! ), park facilities, and plenty of free parking. With ocean and mountain views, you can see everything from Diamond Head to Honolulu Harbor from this downtown haven. There is no sandy beach to be had, but not many tourists know of this spot, so you'll have a greater chance for a private ceremony. Just ten minutes from Waikiki on Oahu's South Shore, you'll find Magic Island, which overlooks famous Diamond Head and Ala Wai Yacht Harbor. Here you can exchange vows on a crescent-shaped beach with magnificent Diamond Head as your backdrop. Part of the ten-acre Ala Moana Park, which boasts green lawns, coconut trees, and an ocean lagoon, Magic Island is a hot spot for couples looking for a barefoot-in-the-sand, romantic ceremony. Like all of Hawaii's public parks and beaches, weddings here are free, and there is also free parking (plentiful during the week but not always so on weekends). Magic Island tends to be crowded during the day, but by late afternoon the beach is relatively empty and the sunsets can be spectacular. Best and least crowded times for weddings are mornings, late afternoons, and weekdays. A popular destination for surfers and body-boarders, picturesque Makapuu Beach overlooks infinite blue waters, rocky coastline, and Rabbit Island. Makapuu also has BBQ grills and restroom facilities. 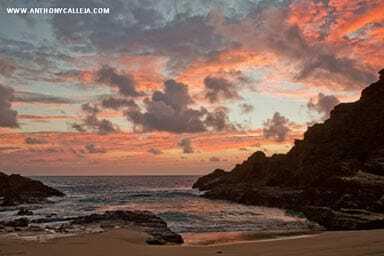 Way less dramatic than the TV show would imply, but just as spectacular, the charming North Shore beaches of Oahu, including Papaiola, Puena, Lanikea, Sunset Beach Park, Ehukai Beach Park, KeWa'ena Beach, Waimea Bay Beach Park, Three Tables, and Ali'I Beach Park, are great for couples looking for pristine white sand, panoramic views and the quieter side of the island. Great for couples looking for Sunset beach wedding with sand and rocks and panoramic views and of the west side of the island. Located in one of Honolulu's most prestigious neighborhoods, just five miles from Waikiki and near the Kahala Mandarin Hotel, Wai'alae Beach is a free public beach with pavilions, restrooms, and easy parking. and, you have breathtaking Koolau Mountains in the distance. There's a grassy lawn area with palm trees and a sandy beach with a bridge crossing a canal. Just down the beach is a small peninsula that leads out to a small tropical island with oodles of greenery and some palm trees. While sunset is a little more toward the Waikiki side, you still get a beautiful sky and more privacy than many of the other outdoor locations. This is a great spot for sunrise weddings and fabulous for photos. This long stretch of white-sand beach stands in the shadow of the magnificent Koolau Range, and is one of the calmer shores. There are restroom facilities and shaded areas. Free. On the north shore of Oahu, set slightly inland amidst the tropical forest, is Waimea Valley and Waterfall. The area has been set aside as a natural adventure and cultural park and there's a ton to do, including kayaking, hiking, spear throwing, lawn bowling, and mountain biking. Unlike the above beaches and parks, Waimea Falls is not free. Situated in downtown Honolulu, this 14-acre leafy oasis is home to unique tropical plants and trees dating from the 1850s, including stunning orchids and palms, and is a popular wedding spot. Permit required. Location: 50 N. Vineyard Blvd. At Nuuanu Ave.
Long a local favorite, this lush, and tropical spot offers weddings in a private botanical garden, open-air chapel, or elegant gazebo set over a tranquil pond. Site fee. Meaning "A Peaceful Refuge," this 400-acre expanse of tropical plants also features a 32-acre lake, picnic areas, and an on-site campground. Permit required. Just north of Foster Garden, this 7.5-acre garden once belonged to Queen Liliuokalani, Hawaii's last reigning monarch. The garden has beautiful picnic areas, and the lovely Nuuanu Stream and Waikahalulu Waterfall running through the grounds Permit required. Winding paths, natural streams, terraced gardens, a gazebo overlooking a lily and lotus pond, koi ponds, and stunning views of the Koolau Mountains and Mount Olomana, make these gardens a primo spot for a picturesque wedding. Site fee. Nestled between the Waianae and Koolau mountain ranges, Wahiawa is considered the "tropical jewel" of the Honolulu Botanical Gardens, boasting 27 acres of Hawaiian palms and native plants. Permit required.